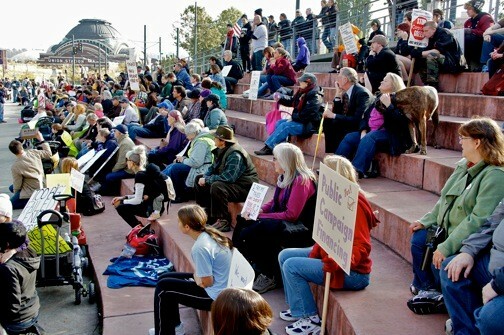 Tacoma joined the ranks of cities nationwide – and globally – to witness a home-grown protest movement that included downtown street marches and an overnight encampment in a city park. 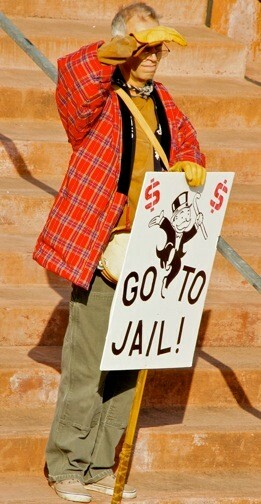 This protester at Tollefson Plaza expressed the opinion of many with his sign. 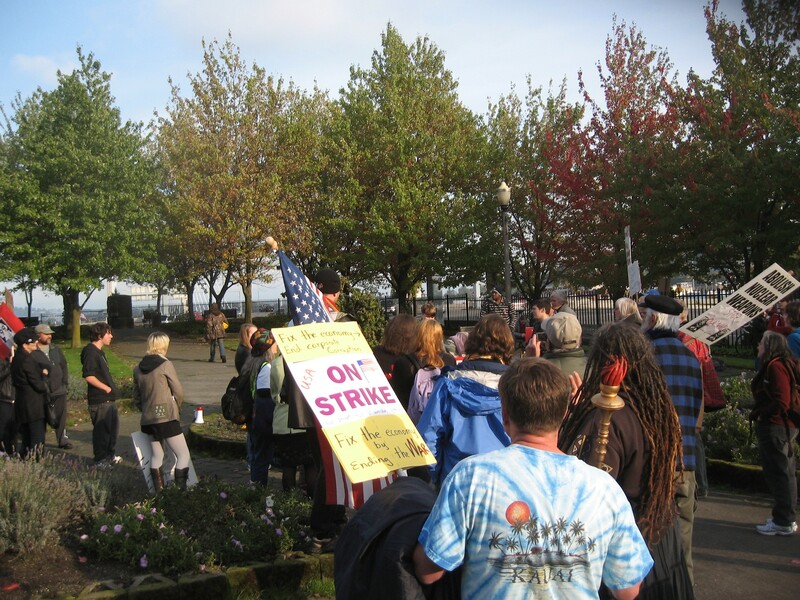 From Peoples Park on the Hilltop to the chrome and glass high-rises downtown on Pacific Avenue, at least 600 people marched Saturday, protesting what they see as the two-headed beast of corporate greed and an increasingly impoverished middle class. Chanting the mantra that has become the identifying slogan of the so-called Wall Street protest movement, “Banks got the bailouts, we got sold out,” the demonstrators spent the afternoon marching throughout the business district, and then rallied in Tollefson Park for speeches and a live music performance. Protesters gathering in Tollefson Plaza, Saturday. Picture courtesy of Karelina Resnick. Mike Collier, minister at Tacoma's United Methodist,, was one of the organizers of the protest. Picture courtesy of Karelina Resnick. 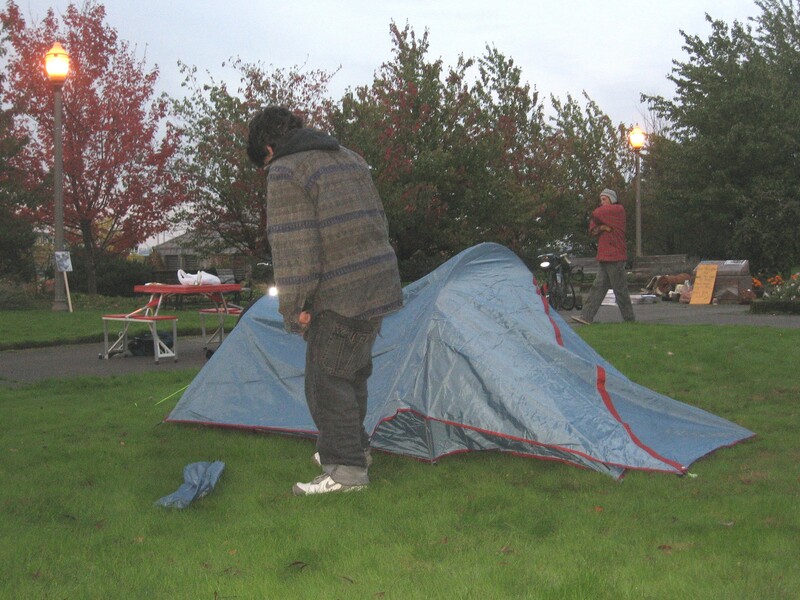 After the main rally, a small group dedicated to an extended ‘round the clock “occupation” relocated to a small park at the corner of Pacific Ave, at the main entrance to I-705 near 21st Street. It’s a parcel that apparently has no official name – at least the protestors couldn’t identify it – but it does have a small monument and plaque commemorating Donald A Pugnetti, and it overlooks the Thea Foss Waterway. About 60 protestors gathered in this park by late afternoon, but as dark settled only about 20 pledged to stay the night. Daunted by the dampness, fog and temperatures plunging towards 40 degrees, only one tent had been erected on the site by 7 pm. Nevertheless, the earlier larger crowds had a range of ages – from teens and students, to young couples with kids and grey-haired protestors seasoned by the protests of the 1960s. But as the day proceeded the vitality of the young won out, and the scene at the encampment was one of mostly twenty-somethings desperately voicing seemingly different aspect of our troubled economy, but joining together in a heartfelt solidarity with each other. These protesters readily acknowledged the lack of a unified message and the dearth of specific, substantive demands, but they all appeared impassioned and satisfied with the day’s actions. 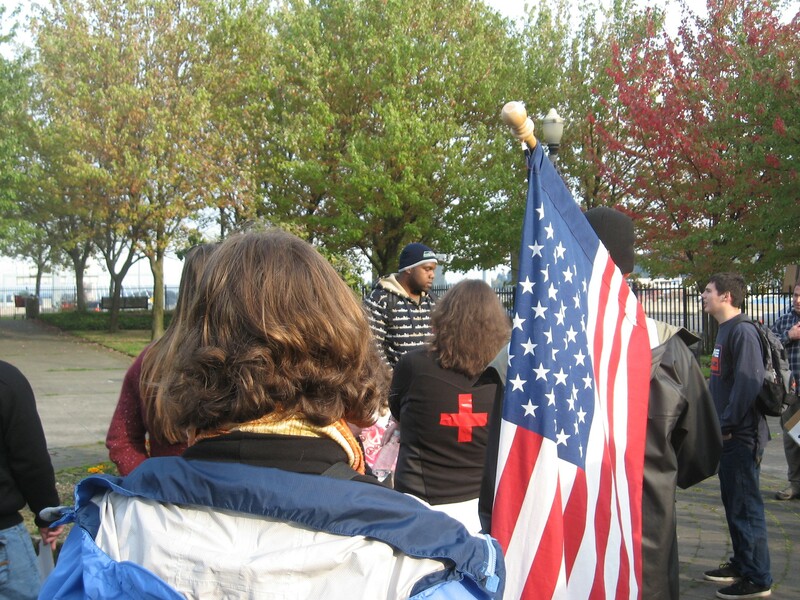 About 60 people gathered in a Pacific Ave park to "occupy" Tacoma as part of the current protests. 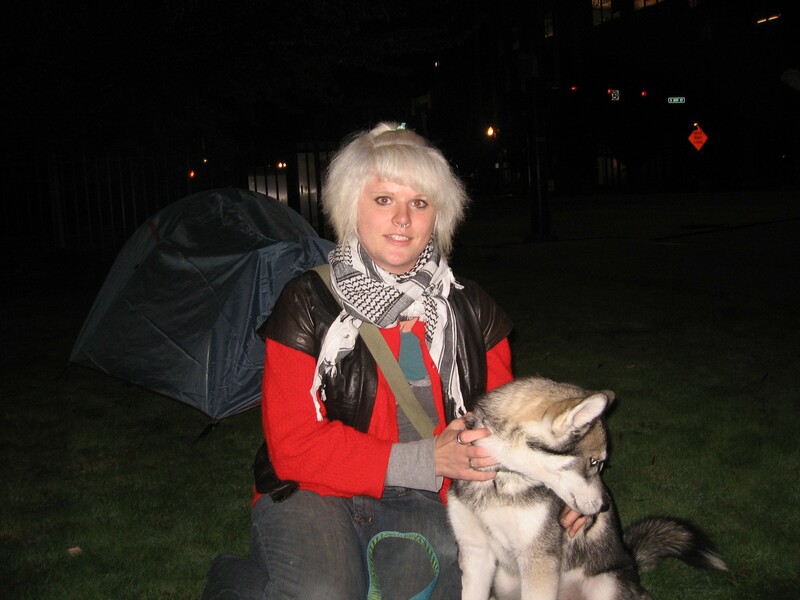 Despite the obvious comparisons with the 1960s anti-war protests and cultural revolutions, the current protests – as seen at the encampment – have their own flavor and generational accents. One is the absence of the amplification of speakers. 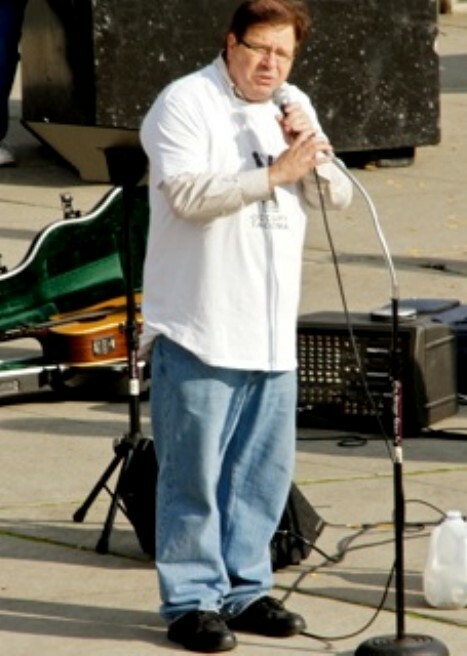 Using the technique of “human microphones” popularized at the Wall Street protests, the words of the original speaker are repeated by the entire group so that everyone can hear what is being spoken. A decidedly charming touch is the way a speaker announces that they would like to speak. He/she shouts out, “Mic Check,” and everyone nearby echoes the shout-out “MIC CHECK,” and the crowd quiets and the speaker continues. This leads to some humorous incongruities, such as displayed by one shy lad who appeared to be about 18 years old. After proclaiming “Mic Check,” he stumbled for words and then simply said, “I’m really nervous,” which was then amplified by thirty people saying loudly, “I’m really nervous,” which put a smile on everyone’s face and gave the speaker a new-found confidence. Each speaker spoke of a personal tribulation or concern. One young man, with an infant sleeping in a stroller, described how a recent visit to a local hospital’s emergency room for a breathing issue cost him $4,000, and he attributed that enormous cost to a pervasive corporate greed that permeates throughout American society. The young man at center voiced his ire at being charged $4,000 for a one-time emergency room visit in a local hospital. One protestor, Evan Dye, stood off to one side of the crowd, but his presence made a powerful statement. He was dressed in full battle gear – minus an M-16 – and he held an American flag on a long staff. Mr. Dye told the Mountain News that he has served in Iraq from 2009-2010, and that his experiences there and upon his return compelled him to join the protest. 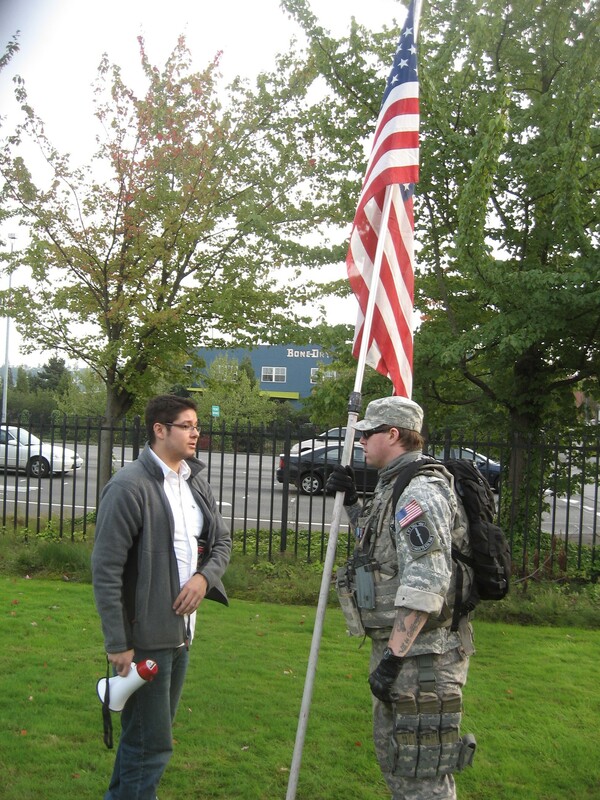 Evan Dye, right, talking with a fellow protester in Tacoma, Saturday. 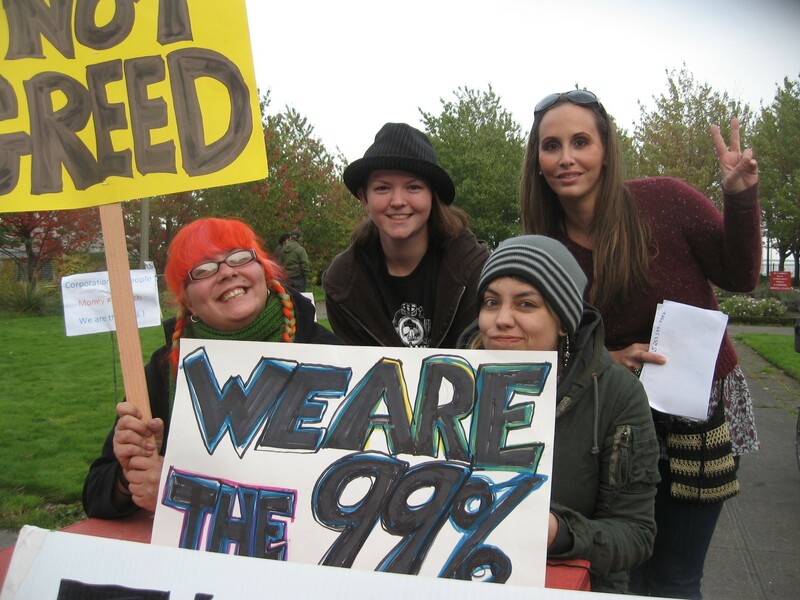 Some of the issues voiced by other protestors were the outsourcing of jobs, such as Chinese workers taking away American jobs, and the fact that a large segment of the population can’t afford to feed themselves. 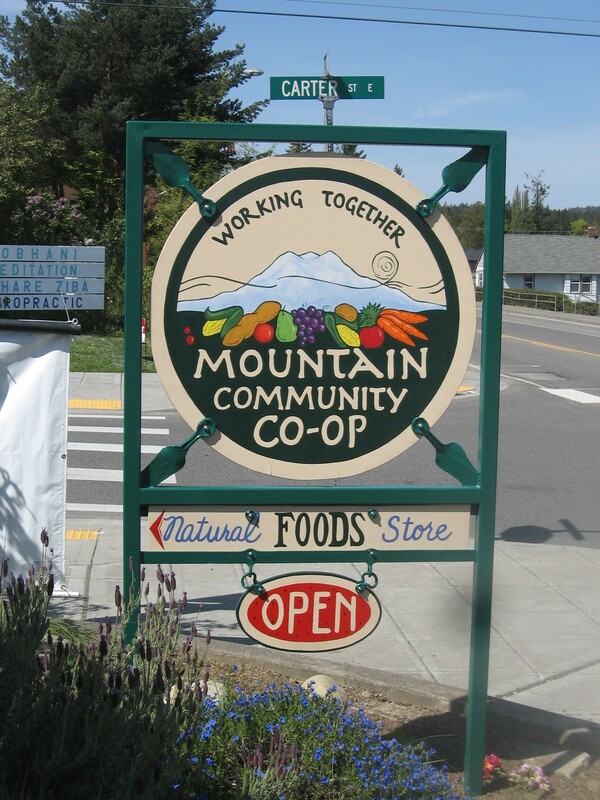 Currently in Pierce County 147,000 people, out of a total population of 800,000, are on federal food stamps or regularly draw foodstuffs from the fifty or so area food banks. Others complained that they have not even had enough employment in their young lives to qualify for unemployment benefits. On a related issue, several young people also complained about the difficulty of finding meaningful training, such as apprenticeships. As for Nikki, she is becoming a self-styled spokesperson for her band of protesters, and says she is starting a fledging newspaper to report the news of the protest. As the fog rolled in, the members of the young generation began to help each other. 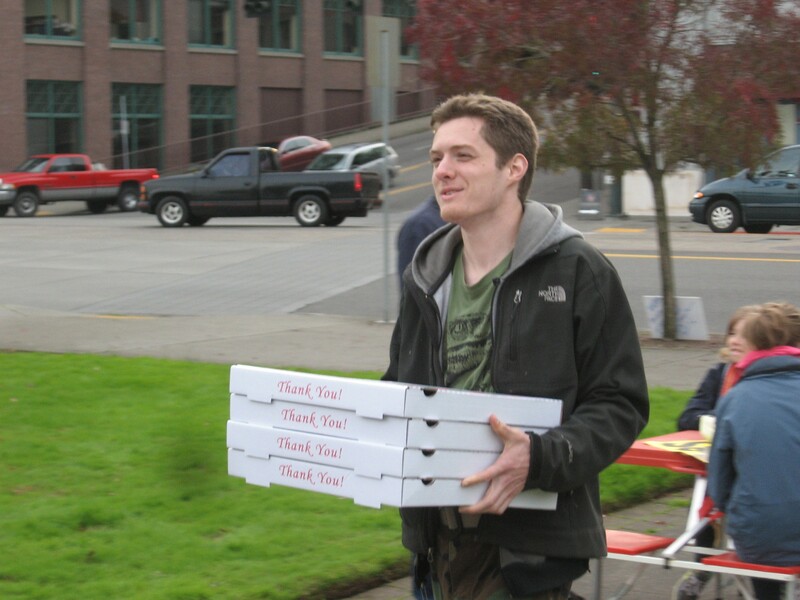 One local, a young woman named Hope Hyland, escorted by “Gordon,” her tiny Malamute pup, delivered two pots of coffee, while a young man from the La Bella Pizzeria on Pacific waltzed into the park carrying six large pizzas. For more information on the protest and “occupation” of Tacoma, the following information has been provided by Stacy Emerson of www.lifeinpiercecounty.com . The one tent erected by darkness, approximately 7 pm. 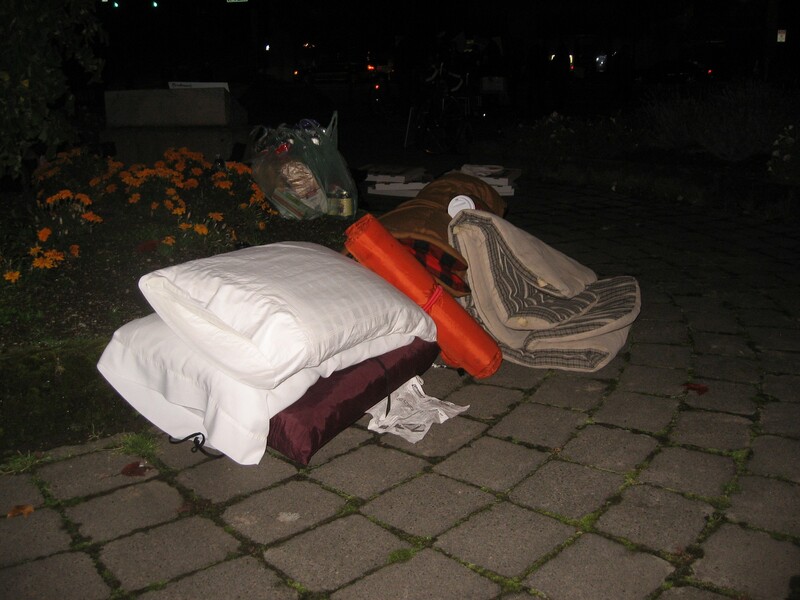 Blankets and pillows delivered to the encampment by gray-haired supporters. 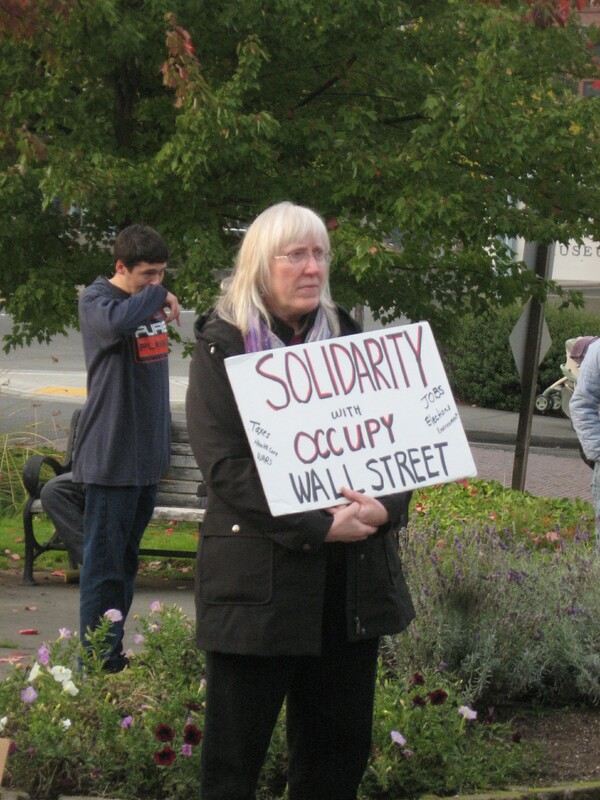 An unnamed protester in Tacoma, Saturday. 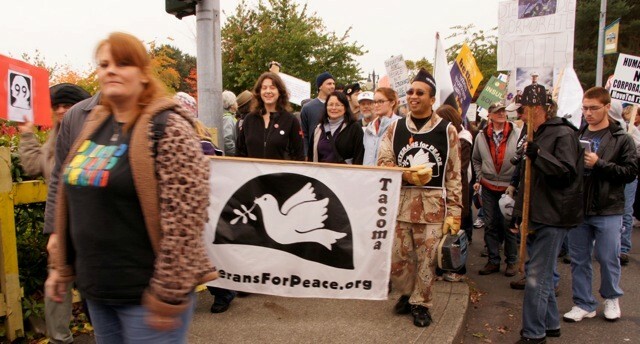 Protesters marching in Tacoma, Saturday. Picture courtesy of Karelina Resnick. This entry was posted in Cops and courts, Culture, Events, Politics. Bookmark the permalink. Excellent coverage Bruce. Great photos Karelina. Mary, there is an alternative way of thinking about the concept of “leadership.” The point of OWS is, first to gather and grow interest and second, to allow for “all” viewpoints and issues to be voiced. 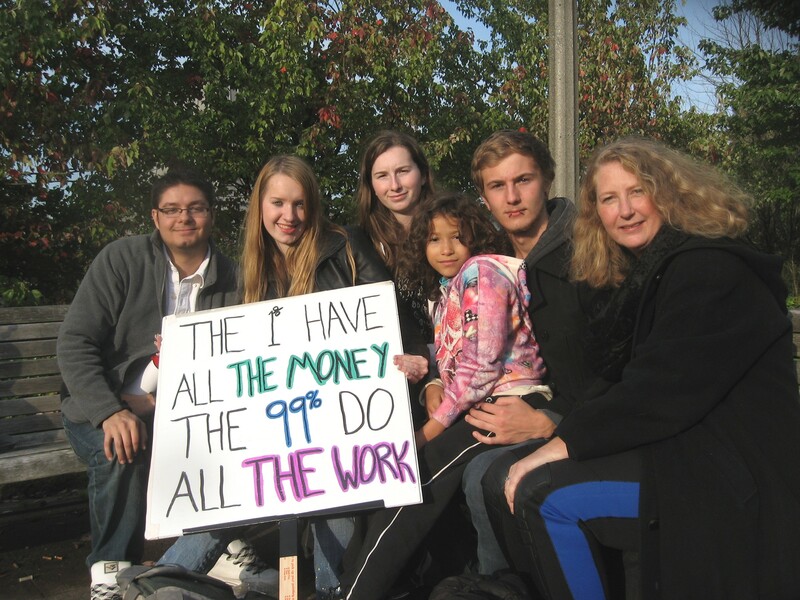 Leadership is not being cultivated because this is a decentralized, grassroots movement. I believe the ultimate goal is to bring to awareness the fact that this whole system is corrupt and needs a total overhaul. Once everyone has been satisfactorily heard and the public is sufficiently educated, perhaps then leaders will arise who will take the movement in various directions. But, the focus right now is just simply to gather.